Chicago Review Press, 9781613736456, 176pp. When a little foal with a white upside-down exclamation point on her forehead was born one morning in Kentucky, the heart of America’s horse racing region, problems mounted quickly. Rejected by her mother, the filly would need to be accepted and nursed by another mare. As she grew, the tall, knock-kneed girl remained skinny and scruffy, with paltry muscles. Considered an “ugly duckling,” she was unsuitable as a champion racehorse, her owner proclaimed, and must be sold. But two days before the sale, an examination revealed a medical condition—now she was impossible to sell! What would become of this problem filly? 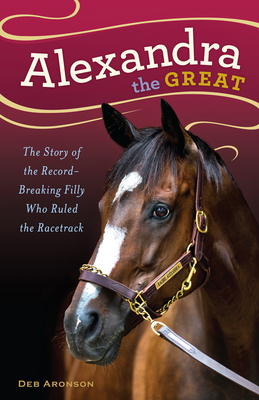 Including vivid details gleaned from interviews with Rachel Alexandra’s owners, veterinarian, beloved jockey Calvin Borel, and more, Alexandra the Great gives readers an exciting and emotional look at both the humans and horses who pour their hearts and souls into the world of Thoroughbred training and racing. Deb Aronson is a freelance writer who specializes in stories about people and animals who have accomplished remarkable things. She is the author of the middle-grades biography E. B. White and a contributor to Muse, a science magazine for middle-grade readers. She lives in Urbana, Illinois.